All types of people were affected by the Great Depression. After the stock market crash in 1929, the country changed drastically. Many people lost their jobs because of this downturn in the economy. During the Great Depression practically every person had to adjust to a different way of living than what they were used to. This paper explores how life changed for children, teenagers, African-Americans, farmers, women, and the middle class. Many factors led up to the Great Depression. Among these are: buying on margin, buying on credit, supply and demand, the stock market crash, and drought. With the popularity of the stock market in the 1920s, people would buy stocks on margin, which meant that people would buy stocks for a 10% down payment and then sell them for profit. This system worked until the late 20s when the stocks rose faster than the value of the companies they represented. Because of the economic boom of the 20s, people were buying cars, refrigerators, etc. that they did not have the money to pay for. They would pay for these things in installments or would buy on credit. After the stock market crash, people could not pay for these things and wound up in debt. As the need for these objects dwindled, factories cut back production and laid off many employees. In 1929 a few stock market investors began selling their stocks and many followed suit. This caused stock prices to fall. The greatest hit to the stock market came on October 29, 1929, known as Black Tuesday. On this day the stock market crashed due to the plummeting stock prices and the unwillingness of people to buy them. The drought in the middle portion of the country in the 1930s led to a decrease in productivity from these lands. Farmers who could no longer support themselves by what they grew hoped to move West in order to find better land and better opportunities. The Great Depression affected everyone. From the very young to the old, everyone’s lives were changed drastically by the events of this period. Many people found themselves out of work and searching for a better life. Children had to deal with changes in their education if they could attend school. Teenagers and their parents were traveling to search for a new life. The middle class had to deal with a life without money and security. The years of the Great Depression were very difficult for those who lived through them and they also mark an important era in this country’s history. During this time many children were deprived of an education because many communities had to close their schools down during the 1932-1933 term because of a lack of money. Some children were lucky enough to be in schools where the teachers did not care that they were going to be paid next to nothing and continued educating. Children also greatly suffered from malnutrition. For example, in a 1932 study by the Health Department in New York City, it was found that 20.5 percent of the children were suffering from malnutrition. Children in rural areas were even worse off. Dietary diseases were rampant because adequate food such as milk, fruit, fresh vegetables, and eggs could not be bought with the family’s low income. The death rate for children suffering from undernourishment was on the rise because children were losing their stamina and were unable to fight off disease. Many teenagers of this period were known for "riding the rails." Teenagers who felt that they were a burden to their families or were ashamed of their unemployment and poverty felt the need to leave their homes to find a life of their own. They wanted to take the adventure of living on their own and trying to find a better life. During the height of the Depression, 250,000 teenagers were roaming around America by freight trains. Some people admired these teenagers for their spirit while others feared them as potentially dangerous. About eighty-five percent of these teenagers were in search of employment. During this period, most of the country’s African-American population lived in rural areas and worked on farms owned by white landowners. Even though these rural African-Americans had known poverty most of their lives, the Great Depression was a hard hit. Their living conditions worsened due to the fact that the farmers they worked for lost their land. Life for African-Americans in urban areas was harder. However, those in these areas continued to work hard at their jobs. They would do hard manual labor or worked in areas that were known for their dangerous conditions such as foundries. Others might have worked as domestic servants for white people. Some also worked for railroads, steel mills, and coal mines. Still others became street vendors or peddlers. Farmers found themselves in a very desperate situation during the Great Depression. In the decade prior to this period, farmers were already losing money because of greater industrialization in cities. For them, the Great Depression just made worse an already dismal situation. Many of these farmers were renting their land and their machinery because of the loss of money in the 20s. At the beginning of the depression, prices on food that the farmers produced deflated so much that the farmers were unable to make a profit off of their land. As a consequence of this, they refused to sell what they produced. If they lived in the middle portion of the country, known at this time as the Dust Bowl, they were also experiencing drought starting around 1932. They could no longer make money off of what they land provided. Usually it was barely enough to maintain their families. As the farmers grew deeper into debt and could no longer make payments on their land and machinery, the banks where they loaned money from foreclosed on their land. Some of these displaced farmers hoped to move West to find better land to farm and better opportunities for themselves and their families. 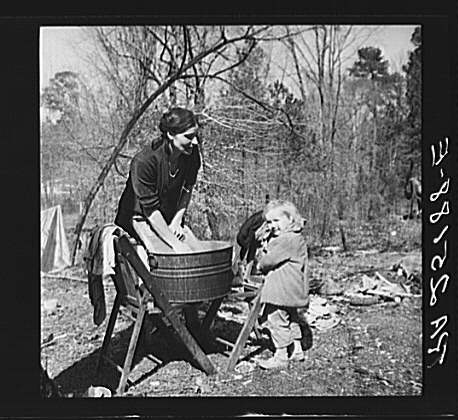 The main role of women during the Great Depression was that of the homemaker. Of course, some women had gone through college and, like their male counterparts, were having a difficult time of finding employment. Those with families had the task of keeping their family together when the principal moneymaker of the family was out of work. These women had to be creative with what they had. They obviously could not create elaborate meals for their families, but they made do with what they had. Some women joined the work force and would do jobs that men previously had held. These women worked as hard as they could to support their families during this difficult time. These people who, after being thrown off their land, chose to move were known as vagrants or migrant workers. In 1932, the United States Children’s Bureau and the National Association of Traveler’s Aid Societies reported that there were at least 25,000 families wandering around the country and it was believed that this was only a portion of the actual number. These families became very susceptible to disease while traveling because of a lack of food and a lack of proper shelter. Most of the time, the families would travel in their cars and would stop at campsites set up by other vagrants along the way to search for jobs in the area. If they were able to find a job, which was practically impossible, they would not have earned enough to support their families. For example, the net earning for an agricultural migratory worker averaged $110 in 1933 and $124 in 1934. These farmers were some of the hardest hit groups during the depression. One group that had to deal with drastic changes during the depression was the middle class. This group accounted for 15 to 20 percent of Americans at this time. The collapse of the stock market and the closing of more than 5,000 banks mostly affected the middle class. The professional men that worked at these jobs now had to deal with a loss of income and unemployment. They now found themselves having a hard time supporting their families. Many of these people could no longer consider themselves in the middle class after the depression took its toll on them. Most people who had worked their way through college found themselves unable to find a job during this time. Their degrees were in no way useful to them. Among the professions that had few job openings were bankers, architects, agriculturalists, educators, and salesmen. A study of fifty-four colleges conducted by the American College Personnel Association showed that 21, 974 women and men holding degrees from these colleges were without jobs. This proves what a dire state the middle class was in because those who would make up the middle class, those with higher educations, had a difficult time of finding a job. The middle class was in danger of becoming politically and socially insignificant because of the numbers of people who were descending from the middle class into the lower classes. 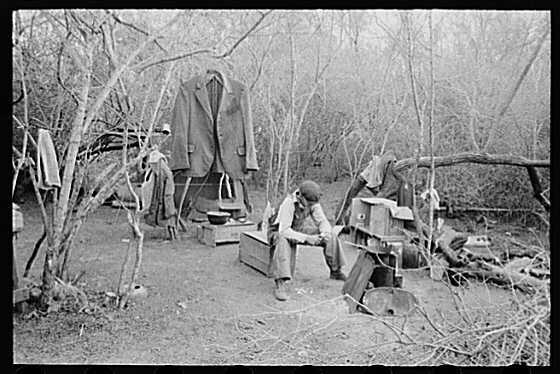 Everyone had to adjust to a new way of living during the Great Depression. The people of this time knew that they had to change in order to survive. Practically everyone had to deal with major losses and drastic changes. Children had to cope with the loss of a stable life and an education. Farmers had to learn to live with the loss of their farms that had supported their families. The middle class had to deal with the loss of money and the potential disappearance of their social class. This period might have been a dark one for this country, but it brought about many changes that still affect the country to this day and, therefore, this was a very important time for America’s history. The Great Depression had many significant consequences for the country. In the political world, the economic distress led to the election of Democrat, Franklin D. Roosevelt to the presidency in 1932. He introduced many changes in the structure of the American economy and implemented what was called the New Deal that began many public-works projects to decrease unemployment. The Tennessee Valley Authority and the Public Works Administration are examples of these public works projects. One agency that was started in response to what happened with the stock market was the Securities Exchange Commission. This agency enforced new security laws that made it necessary that if businesses wanted to sell securities or stocks in their business, the owners had to be truthful with potential investors about their companies and warn them about the risks involved in investing. Another agency, the Agricultural Adjustment Administration, was created in 1933 to help farmers increase their income by reducing supply to boost prices. These are just some of the measures taken by Roosevelt to try to get the country out of depression. However, mass unemployment and economic stagnation continued. About 15 percent of the work force were still unemployed in 1939. When World War II broke out in the same year, this number went down rapidly. Workers were needed in factories to produce armaments and munitions. The end to the Great Depression came after the United States entered the war in 1941. McElvaine, Robert S. The Great Depression. New York: Times Books, 1993. Morley, Felix. Aspects of the Depression. Freeport, New York: Books For Libraries Press, 1968. Shannon, David A. The Great Depression. Englewood Cliffs, New Jersey: Prentice Hall, Inc., 1960. Watkins, T.H. The Great Depression: America In the 1930s. New York: Little, Brown And Company, 1993. Yoder, Dale and George R. Davis. Depression and Recovery. New York: McGraw-Hill Book Co., Inc., 1944.
http://us.history.wisc.edu/hist102/lectures/lecture18.html "The Crash and the Great Depression"
http://econ161.berkeley.edu/TCEH/Slouch_Crash14.html "The Great Crash and the Great Slump"
http://mar.wnec.edu/~grempel/courses/wc2/lectures/depression.html The Stock Market Crash and its effects.